David Beckham’s saga to bring a Major League Soccer team to Miami has taken yet another turn, as the soccer superstar prepares to present plans for a 78-acre soccer campus before the Miami City Commission this Thursday. 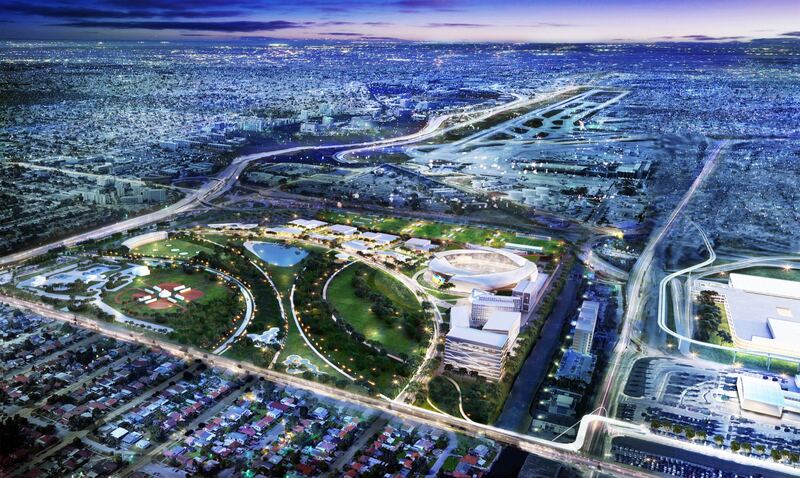 Beckham and his MLS expansion partners have scrapped plans to build the breezy, Populous-designed stadium on land that they already own in Miami’s Overton neighborhood, and are instead looking to develop the publicly-owned Melreese Country Club. Beckham has teamed up with local businessmen and MLS partner Jorge Mas of infrastructure firm MasTec to bring a new, $1 billion proposal for ‘Miami Freedom Park’ before the city. As the Miami Herald reports, plans for the country club had been kept scarce until yesterday, when Mas took to Twitter to reveal the project’s first rendering and a proposal fly-through. Beckham and Mas will argue before the City Commission to put the redevelopment to a public vote in November. If successful, the golf course would be split between a 73-acre, privately funded campus that would include a soccer stadium, retail, office space, and a hotel complex, while Beckham’s Miami Freedom Group would also pay to convert the golf course’s remaining 58 acres into a public park. The proposed soccer stadium looks to be a marked departure from what was revealed in 2017. The new scheme sees an arching swath of buildings cut through Melreese, and the rounded, 25,000-seat stadium (topped with curving canopies reminiscent of an aperture) will anchor the surrounding development. Besides the stadium, which would cover 10 acres, Beckham and Miami Freedom Group are proposing: 600,000 square feet of entertainment space, retail, and restaurant space; 750 hotel rooms and a conference center; 400,000 square feet of office space, down from one million; a “golf entertainment center”; and 3,750 underground parking spaces, up from the Overton plan’s zero. The 58-acre park would be developed through a $20 million payment to the city from Beckham’s group, doled out over 20 years. Beckham and his partners are seeking voter permission to lease the golf course from the city for 39 years, with an option to extend the lease to 99 years and pay four-to-five million dollars in annual rent. Some green space and golf advocates have staunchly opposed the plan and argued that Miami cannot afford to lose such a large public park. However, as the Miami New Times points out, Melreese is currently privately-run and used mainly for golf, which has a notably deleterious effect on the environment. AN will update this story pending the result of the July 12 meeting.